The recorded music industry’s run of good news stories continues with the BPI’s announcement that UK revenues grew by 5.1% in 2016. 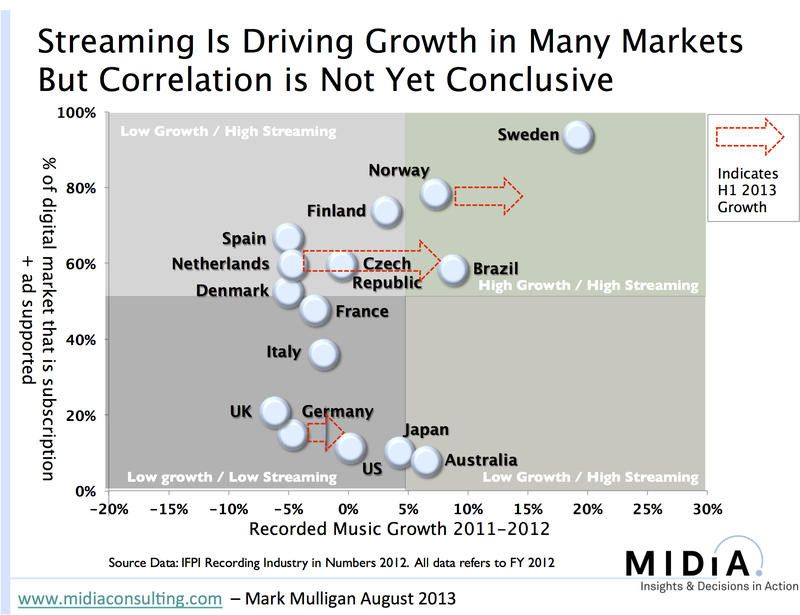 As in other markets, streaming is the fuel in the engine. Revenues hit £925.8 million in 2016, up from £881.3 million with streaming accounting for 30% of the total. Streaming grew by 61% (slightly above the global average of 57%) with subscriptions accounting for 87% of the streaming total. Downloads continued their death spiral, falling by 27% however the £56 million in lost download revenue was more than offset by the £97 million that streaming grew by. Physical revenues fell by just 2% (most of the CD buyers that were going to switch have now done so). Throughout the 2000s the narrative was one of waiting for new formats to grow faster than legacy formats declined. That eagerly sought format replacement effect never happened with downloads, but streaming resoundingly hit that point in 2016. Although streaming doesn’t appear to have started quite as strongly as it finished 2016, the odds are still on 2017 being another year of strong streaming growth. That is not to say that the next 3 years or so are going to be uninterrupted growth across the globe (there will be some speed bumps along the way). Nor are we likely to see the global business recover to its pre-Napster levels. But these certainly look like the foundations of a new, leaner recorded music business. Think of it as a successor state. One with different rules, in which artists have more choice, where routes to market are numerous and technology-led change is the norm. Numerous challenges remain (eg accountability and transparency, commercial sustainability, growing power of the platforms) but it is easier to fix problems when everyone isn’t spending their entire time simply struggling to keep their heads above water. The following are excerpts from recent MIDiA Research blog posts. If you’re not already signed up to the newsletter type your email address in the box on the blog home page and you’ll get analysis and data on the digital content economy straight to your inbox every Monday. Spending money on recorded music has become a lifestyle choice, an honesty box for the conscientious consumer. No one really needs to pay for music anymore. That much is familiar to most, but what is new is that it is now manifesting itself in a new worrying way. 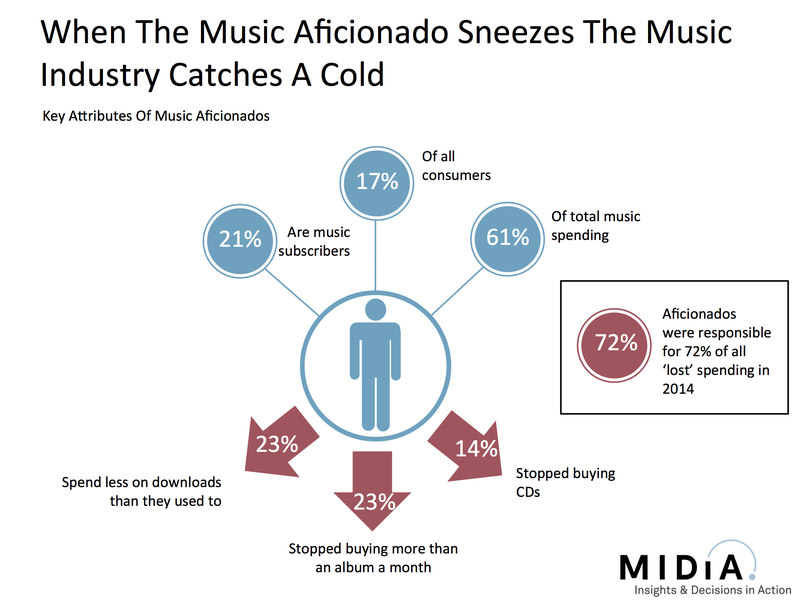 In 2014 consumers actually spent less on digital music than they did in 2013. Though the drop was small – 1% – it was still nonetheless a drop at a period when digital spending should be booming. In some key markets the consumer spending decline was significantly larger, such as a 3% fall in the UK. Of course, overall digital music revenue grew globally in 2014 but all of that growth came from the 37% increase in digital music B2B revenues, such as advertising income and telco bundles. In short, the music industry is getting better at selling to businesses and worse at selling to consumers in the digital arena. With B2B digital revenues 6 times smaller than consumer digital revenues the music industry is not about to suddenly become a B2B2C business. But the direction of travel indicates that there is a problem. Read the original post in full here. The music industry has long been viewed as a canary in the mine for how media industries transition into the digital era. In many respects that role has now been outlived. Book publishers quickly realised that after a few short years they had moved beyond where the labels had got to in 10. Meanwhile games publishers (mobile, console and PC) have learned how to monetize their super fans in a way the music industry could only dream of. But it is the video sector that provides the starkest contrast. Old favourites trump new gems: Half of free streamers say they use these services mainly to listen to music they already know. While it would be unrealistic to expect anything other than the most on-trend of super fan to be spending all their time sampling new tunes, these trends illustrate that free on demand streaming services are most used as consumption destinations. The end goal has changed: Just under a third of free streamers go onto buy the music of artists they discover on these service while 37% simply stream newly discovered artists more. Both use cases will coexist for some time, but with with music purchasing fading phenomenon, the latter will dominate. The TV business is of course a vastly bigger one than music but it is, in years spent terms at least, at far earlier stage of its streaming subscription transition. And yet already there are more than twice as many online video subscribers as there are music subscribers and the nascent online video subscription market is already bigger than the entire recorded music business. Even discounting the relative scales of each business, the comparisons illustrate the contrast between what can be achieved with a niche product aimed at largely male, high spending super fans (music) and the reach a lower priced, more broadly targeted product can do (even with the hindrance of limited catalogues). The days of other media industries learning from the music industry are gone. Now it is time for the music industry to heed its lessons from its peers.